The global market for latex-saturated paper was valued at US$ 2.6 Bn in 2018, and is projected to clock a CAGR of 4.3%, during the next eight years. Latex-saturated paper is a type of specialty paper which is suitable for use in cleanroom environments, and is also widely used for bookbinding and publishing, packaging applications, retail advertising, and as backing in construction products such as tapes. Latex-saturated paper is used as documentation paper and copier paper in many cases. Usually, fibers in a latex-saturated paper comprise at least 50% of cellulosic fibers. In most of the cases, the paper comprises of only cellulosic fibers. Of these, it has been observed that softwood and hardwood fibers enjoy maximum preference for the production of latex-saturated paper. In the industry, it is mostly SBR Latex (Styrene-Butadiene), which is used in latex-saturated paper. SBR latex enhance properties which render it ideal for wet applications. The wet strength of latex-saturated paper also enables its use for products such as paper cup carriers used in foodservice outlets. The global latex-saturated paper market has been segmented on the basis of basis weight, composition, and application. By composition, the global latex-saturated paper market has been segmented on the basis of cellulosic fiber and non-cellulosic fiber. It was found that cellulosic fiber has a higher preference in the market. Furthermore, in many variants of latex-saturated paper, there is no presence of non-cellulosic fiber. The types of cellulosic fibers considered in the study include fibers made from softwood and hardwood Kraft pulp, rice, bamboo, jute, rye, and others. The common non-cellulosic fibers considered during the research include glass wool, thermosetting polymers, thermoplastic polymers, and others. On the basis of application, the global latex-saturated paper market has been broadly segmented into – construction products, packaging applications, publishing & bookbinding, and veneer backing. Latex-saturated paper is considered as one of the ideal solutions for trade show graphics and anything which requires promotion. It is critical to create high-end and visually-appealing graphics. Therefore, there is a requirement for paper products and substrates that have high printability coupled with durability. Trade show graphics require a wide range of media for end products such as tabletop displays and banner stands, for which latex-saturated paper comes out as one of the top choices. Latex-saturated paper is versatile in nature and is one of the most preferred products for the job. Latex-saturated paper is cost-effective and is highly preferred by sign and banner suppliers. The latex-saturated paper market is driven by the growing demand for graphics media with varying finishes and high printability. Another key factor boosting the demand for latex-saturated paper is its increasing use in point-of-purchase applications to increase sales. Growth in the use of latex-saturated paper at POP is expected to be more prominent in developing countries such as India, where organized retail is expected to clock double-digit CAGR in the next decade. The increase in consumer spending on retail has led to innovative products, which brand owners effectively promote in brick and mortar stores, thereby increasing the demand for latex-saturated paper. One of the key factors expected to hamper the growth of the global latex-saturated paper market is competition from the increasing use of plastic-based digital fixtures. Although latex-saturated paper is widely used due to its high printability, which enhances the chances of impulse buying among consumers, it is expected that plastic-based fixtures could hamper market growth. Advancements in modern technologies such as branding through wall covering & fixtures using digital techniques, are likely to hamper market growth of decor applications of latex-saturated paper. These fixtures do not require wooden substrates and may be formed using plastic equipment. Although, to provide wooden texture, individuals use laminates for interior designs of offices, institutes, and houses. The growth of digital media to communicate with consumers is also one of the key restraints to the growth of the global latex-saturated paper market during the forecast period. The recent upward trend in online shopping could hamper the growth of the latex-saturated paper market. This is due to changing consumer buying patterns. The modern consumer is well aware of product specifications, and relies more on peer recommendations, coupled with their own knowledge, to make purchase decisions. The Asia Pacific region is estimated to represent the highest incremental $ opportunity for the latex-saturated paper market during the next eight years. This is due to the growth in penetration of the organized retail sector in developing countries in the region such as India and China. Furthermore, as the retail sector growth in India is set to remain in double-digit figures for much of the forecast period, the demand for latex-saturated paper for promotional posters and point-of-purchase advertisement is expected to rise. Key players profiled in the research report on latex-saturated paper include Potsdam Specialty Paper, Inc., Nar SpA, Neenah Inc., Mask-Off Company Inc., EMI Specialty Papers, Inc., Mafcote, Inc., Paperfabriek Schut B.V., UPM-Kymmene Oyj, The Griff Network, Daifuku Paper Mfg. Co., Ltd., Sihl AG, Laufenberg GmbH, and Ecological Fibers, Inc. In this report, Transparency Market Research offers an 8-year forecast of the global latex-saturated paper market between 2019 and 2027, along with historical data of during 2014-18. This Transparency Market Research report studies the global latex-saturated paper market for the period 2019–2027. The prime objective of this report (latex-saturated paper market) is to offer insights and key market trends regarding the global latex-saturated paper market. The global latex-saturated paper market report begins with a crisp executive summary for various categories and their share in the latex-saturated paper market. This section includes the crux of the report which includes how the latex-saturated paper market is affected by various factors. It also includes global value and volume for the duration 2014-2018 and 2019-2027. The Y-o-Y growth is also provided for a better understanding of the market, which is further explained by the graphical representation of the global latex-saturated paper market. It is followed by market dynamics and an overview of the global latex-saturated paper market, which includes TMR analysis of market drivers, restraints, opportunity analysis, and trends that are affecting the growth of the latex-saturated paper market. This is followed by a case study, which summarizes the results of a survey conducted by TMR on the impact of digitalization on the latex-saturated paper market. This involved 53 retail brands across the globe, as well as 204 consumers. The global latex-saturated paper market is segmented on the basis of basis weight, composition, and application. By composition, the global latex-saturated paper market has been segmented on the basis of cellulosic fiber and non-cellulosic fiber. It was found that cellulosic fiber has higher preference in the latex-saturated paper market. On the basis of application, the global latex-saturated paper market has been broadly segmented into – construction products, packaging applications, publishing & bookbinding, and veneer backing. The next section of the report on latex-saturated paper highlights the unique selling points of the report, including a crisp value chain covering the manufacturing, converting, and distribution aspects of the market. The value chain is aimed at providing a better understanding of the entire latex-saturated paper market landscape added to it is the profitability margin validated by the primary interviews of Transparency Market Research. To understand the level of competition in the market, Porter’s Five Forces analysis has been performed to assess the latex-saturated paper market based on the bargaining power of suppliers and buyers, threat of substitutes and new entrants, and level of competition. This will assist in deciding the go-to-market strategy for someone looking to enter the global latex-saturated paper market. A detailed PESTLE analysis covers the key political, economic, social, technological, legal, and environmental factors which affect the global packaging industry, as well as the latex-saturated paper market. The next section of the report focuses on the global latex-saturated paper market by each segment, as well as region, for the period 2019-2027. The study assesses the Y-o-Y growth of the latex-saturated paper market as well as the attractiveness of the different segments based on their forecast CAGR growth and market value share. 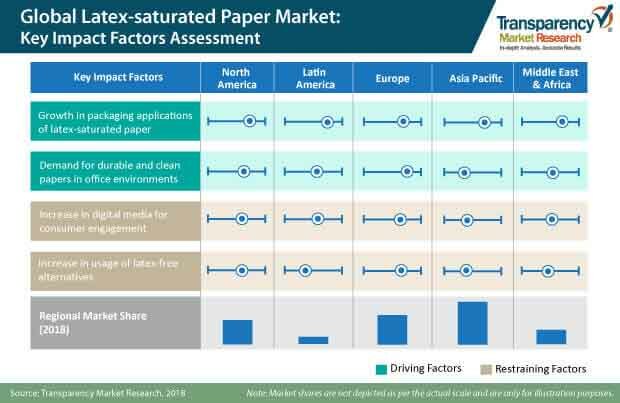 Key regions assessed in the report on latex-saturated paper market include North America, Latin America, Europe, Asia Pacific, and Middle East & Africa. To assess the size of the latex-saturated paper market in terms of value and volume, the revenue generated by the key players and their respective production capacities were taken into consideration. The forecast provided in the report highlights the total revenue generated across the latex-saturated paper market. In order to provide an accurate forecast, we commenced by sizing up the current market, which formed the basis of what path the latex-saturated paper market is expected to take in the future. Given the characteristics of the latex-saturated paper market, we triangulated the outcome on the basis of three different types of analysis- based on supply side, downstream industry demand, and the economic envelope. In addition, it is imperative to note that in an ever-fluctuating global economy, we not only conduct forecasts in terms of CAGR, but also analyse the market based on key parameters, such as year-on-year (Y-o-Y) growth rates, to understand the predictability of the latex-saturated paper market and identify the right opportunities across the market. The regional section analyses the latex-saturated paper market by each segment for all the key regions in the scope of research. Our analysis shows that the APAC latex-saturated paper market is to spearhead growth, in terms of revenue opportunity, CAGR growth, and market share for the forecast period. In the final section, TMR has provided the latex-saturated paper market ‘dashboard view’ which compares the key players in terms of parameters such as product portfolio, key strengths, scale of innovation, estimated market shares, and total revenues. The aim is to provide clear understanding of how latex-saturated paper manufacturers perform when their parameters are pitted against one another. Moreover, it is primarily designed to provide clients with an objective and detailed comparative assessment of key providers specific to a particular segment of the latex-saturated paper. Report audiences can gain segment-specific manufacturer insights to identify and evaluate key competitors based on an in-depth assessment of their capabilities and success in the latex-saturated paper marketplace.